If you have to force gel polish off at all, you are doing something wrong. Some gel-polish manufacturers advise that a soft tool like an orangewood stick be used to help gently push off the gel-polish after it has been soaked for an appropriate length of time, but that it should require little to no pressure at all to slough off the nail. The goal is to keep the natural nail plate firmly intact and healthy for its next application. “If just running the orangewood stick down the nail isn’t enough, then you need to reapply the remover and wraps,” says Candido. Schoon notes that the recent advent of new gel-polish lines poses a unique challenge for nail techs. Traditionally, nail techs would only soak-off the entirety of an enhancement product maybe at most twice a year. The product is typically left on the nail and as it grows out, the new fresh nail plate at the base of the cuticle is prepped and filled. Now, nail techs are being asked to remove the entirety of the product every two weeks for a color change. And many technicians are unclear and untrained as to how much time the removal product requires them to soak for a proper loosening of the product to the natural nail. 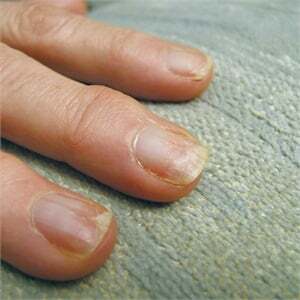 The first job for nail technicians is to protect the natural nails of their clients. Anytime you scrape the nail you are harming the natural nail. Nail technicians also have an obligation to educate their own clients on how to take care of their nails at home. Too many clients are their own worst enemies when it comes to nail health, pushing their new gel-polish manicures too far among the rigors of everyday life. Get yourself out of other sticky situations, whether it be rude customers or clients with health issues. 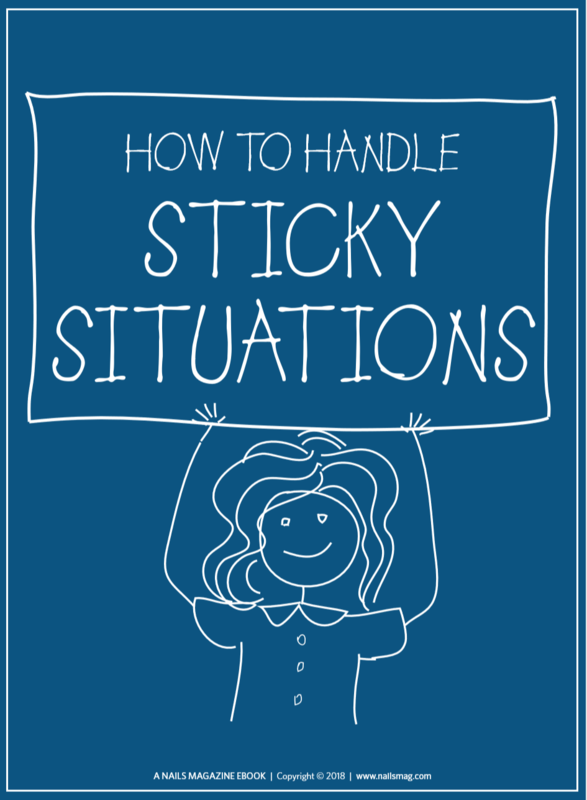 Download our ebook on How to Handle Sticky Situations. “They go out and think they can do anything they want, but if the client starts picking at them she can really end up injuring her nail plate,” says Jim McConnell, who has seen his share of manicure-abusive clients. For the nail technician, she needs to advise her clients that the health of their own nail beds is their responsibility too. When they are away from the salon, they need to watch themselves around chemicals similar to acetone. Simple isopropyl solutions used for everyday cleaning can start to break down gel-polish. And clients should never pick at their nails. This pulls the nail plate keratin just as when a nail tech scrapes and pulls too hard during removal. For technicians, the answer to this problem literally is right in their hands. And if the industry works together to help one another become better educated, all will benefit. The clients will have happy nails, and will continue to contribute to the growing success of gel-polish and the nail industry as a whole. Doug Schoon has been instrumental in starting the education campaign on how to properly soak off gel-polish. Through his website schoonscientific.com, he supplies the close-up, microscopic effect that happens when nail plates are damaged by improper removal. Here are four high-resolution and zoomed-in images of the type of damage improper removal does to nail plates. Image 1 is magnified over 3,000 times and shows damage caused by “prying” residual UV gel-polish from the nail plate. A large cluster of these can create the appearance of white to off-white spots or patches. Images 2 and 3 show that even a wooden pusher when used incorrectly can damage softened nail plates and bunch up nail cells like a throw rug sliding on a slippery floor. Look closely and you’ll see where a wooden pusher created the wide gouges leading up to these damaged areas that range in size from one half to twice the thickness of a human hair and smaller. Imagine the damage a metal pusher and heavy hand could do. The spots are small, but many of them bunched together create the appearance of a diffused white spot in the nail plate. Fortunately, this type of damage is avoidable for most people if these coats are properly removed. UV gel-polish may not always be suited for every nail types, like problematic thin or weak nail plates. As always, nail professionals should use their professional judgment when assessing a client’s suitability for any nail service. Image 4 is a nail magnified almost 200 times to show a nail bed surface scattered with islands of UV nail color coatings that were not properly removed. This is often how the damage starts. Overly aggressive scraping with any implement significantly increases the risk of surface damage. Filing away the residual coating with an abrasive can also lead to excessive nail plate thinning. It’s best to follow the manufacturer’s instructions and/or always allow sufficient time to properly soften the gel-polish with remover before ­attempting to remove it from the nail plate. If the UV coating hasn’t sufficiently softened, continue softening until the coating can be removed without damaging the nail plate. Don’t rush, and always take the necessary time to completely soften the UV coating before ­gently removing with a cautious approach and careful touch.